It’s seems like most apps out there are built to cater to consumers. Whether you’re making a gaming app or one that brings more people to your hair salon, it’s not that strange to see all sorts of articles online about how to market your app and design it to become something beautiful. 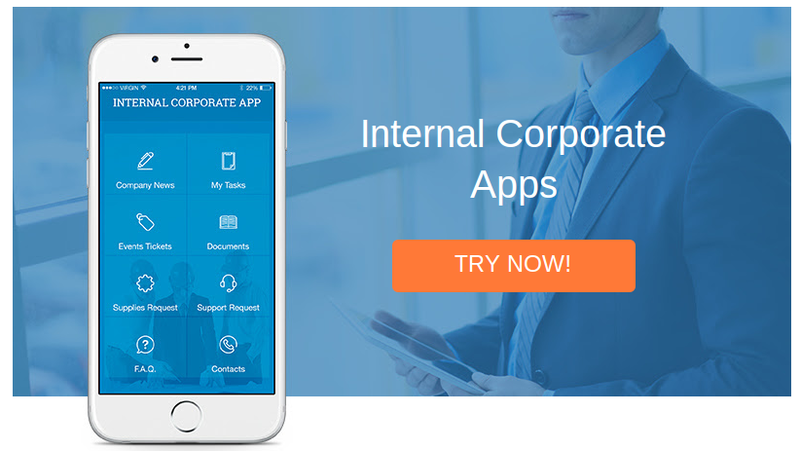 However, internal corporate apps for your company are just as important, and they can turn your day-to-day into a more pleasant experience. For example, let’s say you run a startup with ten people on your staff. You may want to send out company news to keep people updated on if the business is in the press. You can also have buttons in your app for requesting supplies, ordering tickets for events and asking for marketing support. When you think about it, some companies are not going to need an app that’s consumer-focused. However, an internal app might be just what you need to maintain professionalism and organization throughout your business. Recently, iBuildApp released a handful of brand new internal corporate app templates for you to utilize for your company. All of them are ready to be implemented, and the customization options are all the same for when you need to brand the app or make it a little different from the template. 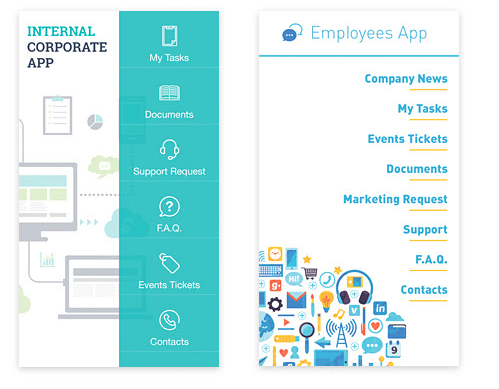 What Do The Corporate App for your Company Templates Look Like? The screenshot above reveals just a few of the new releases, but as you can see they all have blue color schemes. This is intentional, because blue is a common color for corporations, and you always have the ability to change around anything you want on the backend of iBuildApp. Feel free to upload your own logo to stick to your branding strategy, and utilize the buttons to send employees to the right places. We figure that some of the businesses that use these apps are going to simply take the template right out of the box and take advantage of all the default buttons and pages. Others will modify the buttons and make their own pages to cater to their own businesses. What Are the Features from These Corporate Apps for Company Templates? The company app news section is similar to a website blog. The only difference is that none of this news is published for the public. Therefore, if you’d like to share press releases or mentions of your company in the news, all of your workers can open the app and take a look at what the publications have to say. You can also decide to create your own content if that’s more suitable. It becomes tedious when you have to constantly call someone in your company to get more supplies. This feature streamlines the process and ensures that everyone in your organization has all the tools and gadgets they need to get their jobs done. We like this feature in apps the most, because all companies are going to be sharing documents. You have the chance to link to a storage area where all of the employees can reveal and download certain documents. For example, a real estate agency would find it useful to have blank contracts. Let’s say your startup goes to a conference every year. If that’s the case, you may need your employees to sign up one-by-one in order to all get tickets. That’s where the Event Tickets feature comes into play. It’s nice to have a task list for your groceries on a phone, but what about your work task list? Many people would say that they would like to keep this separate from personal items, so it provides an area for workers to remember what they have to complete during the week. You can also make it so that employees can see tasks from other people and collaborate if needed. This one is similar to the supplies request form, but it can connect directly to the marketing department. Looking for a social media post design or a press release? This is the place to go. The glory of these internal corporate apps for your company is that they have full customization built-in. Modifying what you see only takes a moment, and you can truly turn this into a powerful app for your organization. If you have any questions about getting setup with an internal corporate app, feel free to drop a line in the comments section below.